Two hours isn’t a great deal of time for anyone’s life to be condensed down to, especially not that of Jacques Cousteau, and yet The Odyssey gives a good go anyway. A deep-sea diver who became a pioneer of underwater exploration and documentary filmmaking, Cousteau was first a showman. In the opening of the film Cousteau, played by Lambert Wilson, attends a screening of one of his early expeditions and takes to the stage to answer the audiences’ questions – he seems to find as much comfort under the spotlight as he does underwater, speaking with great ease and incredible charm. If you hadn’t seen any of Cousteau’s own groundbreaking films, they may be familiar from Wes Anderson’s A Life Aquatic with Steve Zissou, which took on the stilted style of Cousteau’s semi-staged documentaries. It also included a lot of biographical information about Cousteau that bobs up here in The Odyssey with much more dramatic heft. The key component and through-line to this story is Jacques’ relationship to his son Philippe (Pierre Niney). Whilst his loyal wife Simone (Audrey Tautou) and crew remain supportive of his over-ambitious attempt to produce films for studios, it is his prodigal son who provides a realisation and rebirth for the legend as he is known today. Although it only focusses on a few decades in Cousteau’s life it still feels packed with information. With so much to include, it impinges on the atmosphere and characters, with events following each other in such rapid succession that it can be difficult to take them in or take them seriously. Needless to say Cousteau was an extraordinary man, though not without flaws, and there is a lot to discover about him and the forging of his legacy in The Odyssey. Maud is a passionate artist with arthritis and a bad leg, eager to get out into the world and free from her aunt’s care to make a life for herself. Idly looking over paint cans in the store she hears the grunts of an inarticulate local wanting to put up an ad for a housekeeper. This is Everett Lewis, a stubborn and neanderthal-like man who has trouble communicating at all, much less show compassion. The film looks at how these two opposing personalities come together, as Maud gently forces her way into his life initially as his live-in maid, bringing with her warmth and colour, painting the walls and windows of his humble shack as a perfect metaphor. Maud has a romantic outlook on the world best encapsulated in her paintings that take the best from all seasons. Sally Hawkins is utterly transformed bringing this real folk artist to the screen: posture shrunken down with her shoulders brought in though her smile remains permanent. Hawkins is artful at magnifying small personal victories through her infectious smile, a trait reminiscent of her break-out role in Mike Leigh’s Happy-Go-Lucky but Maud is a little more meek, on the surface at least. Ethan Hawke plays against type as Everett, so often the sensitive one it’s hard to believe his masculine posturing. Everett is shown as gruff and aggressive, hard on Maud from the outset and reluctant to hire her in the first place. It’s clear that that his hostility comes from feelings of inadequacy and yet Maud never really has her moment. We see him grow passive to her, a comedic way of relaying that things have changed in the household. She cooks and cleans as required but continues to paint simply because he never tells her to stop. Whilst it is interesting to avoid the obvious moments, having Everett’s tenderness or understanding occur off-screen makes it hard to sympathise with. In all Maudie is a little slow and perhaps deservedly heavy on sentiment, with a relationship that is quite hard to engage with, but Hawkins performance is a triumph. The opening of Scribe might seem like a joke, an office-worker is told by his superior that he needs a file ready for morning – cue a montage of paperwork and filing but cut together as though it were an espionage thriller. The strangest thing about this is: it works. François Cluzet (The Intouchables) is stressed-out filer Mr Duval, knocking back whiskey between staples in this introduction. Two years later he is on the wagon and off the payroll, looking for work to distract him from his addiction. Interviewed by the mysterious Clément (Denis Podalydès) for a private security firm, he is asked about the gap in his employment and his political standing. The work, it turns out, is to transcribe conversations from tapped phones, requiring the utmost discretion. Clément apparently has a visual memory and distrusts digital technology and so requires someone to type out every word on a typewriter and without mistakes. Offered a decent salary Duval accepts the job but the confidential nature is stressed to the point of suspicion. Each day he must enter an apartment, listen to tapes and type up what he hears, leaving the pages to be collected without ever having contact with anyone. With no friends or family apart from his AA group, Duval is a loner, so when he eventually hears a phone-call that is disturbing, he has no-one to turn to. In fact a lot of the scenes take place in large locations with only Duval or one other, from his apartment to a conference room or even a stadium. This could be a thematic motif of a small fish in a big pond, isolated from the world around, or maybe just a way to save on extras. Either way it is clear from the off that things are not going to turn out well. The original score sounds a lot like a muted Phillip Glass with a circus kind of mania about it – this is a slippery slope into a dark political underworld. There are obvious touches of Francis Ford Coppola’s The Conversation but the analogue tapes and reels have been smoothed out and the film has its own clear and clean style. What is so impressive is how the shots of Duval typing alone are made to be engaging, exciting almost. It is when the plot inevitably thickens that it also becomes forgettable, as the story itself is unconvincing and of little interest in the end. Anselmo Garcia (Miguel Martin) is a humble and unassuming shepherd who lives in a small farm house with his dog. A man of simple pleasures who sees no use for a television or telephone, Anselmo appreciates the simplicity of life: in food, coffee and classic literature – but now they are trying to take that from him. When two men representing a construction firm propose to buy Anselmo’s land in order to build a new housing complex, it is clear that he is not even tempted. Miffed by his apparent disinterest in the money they turn aggressive. What soon transpires is that Anselmo’s land is the last piece of the puzzle, and that all of his neighbour’s have already signed away their property. In order for the deal to be closed, they are reliant on Anselmo parting with his property, and so he finds the pressure increasing from all sides to leave behind the life that he knows and loves. One of Anselmo’s neighbour’s is the sharply dressed slaughterhouse owner Julian (Alfonso Mendiguchía). When he takes Anselmo to his sterile factory floor filled with steel machinery, it is clear that this life is the complete antithesis of the shepherd’s – harvesting animals as opposed to rearing them. But despite his appearance, Julian is in great looming debt and beginning to get desperate. The morals guiding this storyline are cut and dry from the outset and the money-hungry suits make for pretty two dimensional villains. 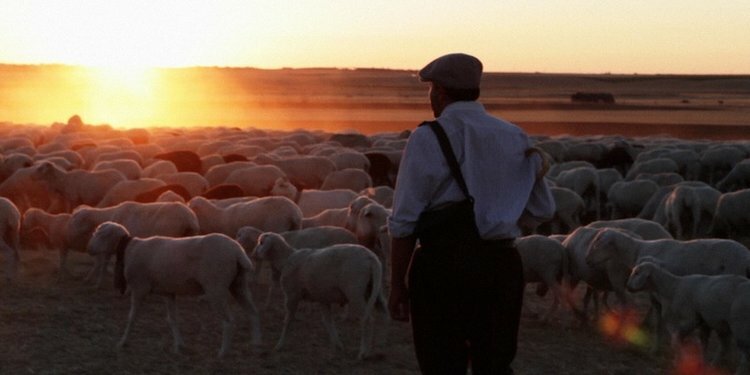 What is impressive is how the film imbues a romanticism into the shepherds way of life through the images on screen and with a modest budget. Capturing a flock of sheep on this rural Spanish landscape in the early lavender hours of the morning and the firey colours of dusk. The story is a most definitely a slow burn with performances from the supporting cast that are pretty ropey for the most part, but there are moments which incapsulate the argument of simple living over the stress of modern life quite nicely.